It was a matter of time: after the bad reviews that Apple maps are reaping from its appearance, iOS 6.0 users start to get impatient for the arrival of the Google Maps app to the App Store. Hence arose a petition Charge.org portal where you asked Google to develop Google Maps application for iOS. "Maps of the Apple app offer much less detail and less information than the previous Google map application, one of the most commonly used functions for many smartphone owners. It's not fair that Apple customers who upgrade their operating system to obtain a product and worse service. " This request will go directly to Google. If you want to sign, so you only have to access the portal Charge.org activism . 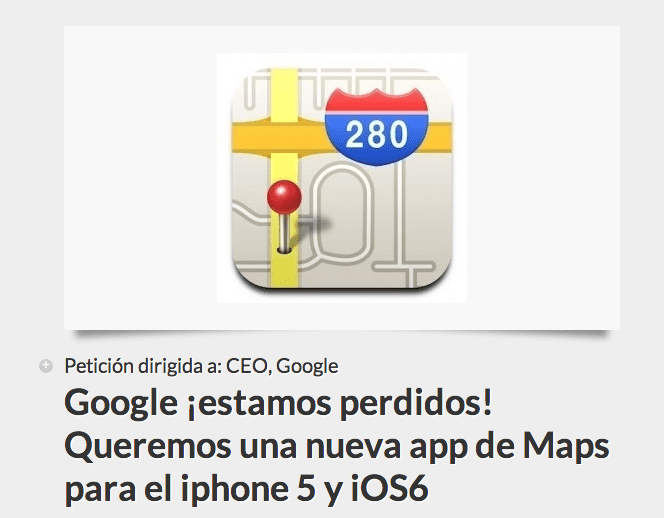 More- Eric Schmidt says that "Apple should have stayed with Google Maps"
Article Over 2,800 people have signed a petition calling for the implementation of Google Maps was originally published in News iPhone .